Slow down, rough road ahead. Slow down because of road-works. 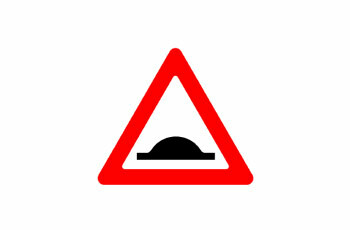 Slow down and cross the speed bumps With caution. Slow down and prepare to bypass obstacles on the road. A distance of about 250 meters to an approaching level crossing. You should always stop at a distance of one meter before the level crossing. Slow down and stop. Railway tracks 50 meters ahead. 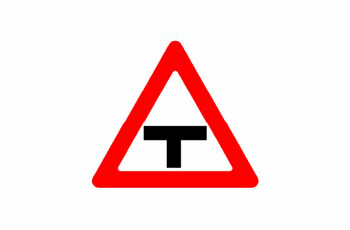 Slow down and prepare to stop before the level crossing, if necessary. 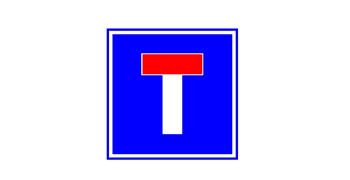 Entry is permitted for all commercial motor vehicles that have an all up weight which exceeds the weight indicated in the sign. 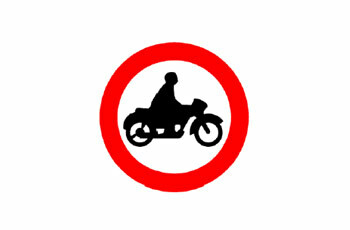 No entry for any vehicle that has an all up weight which exceeds the weight indicated in the sign. 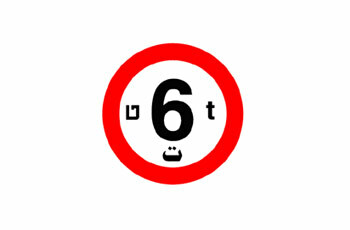 No entry only for commercial motor vehicles that have an all up weight which exceeds the weight indicated in the sign. 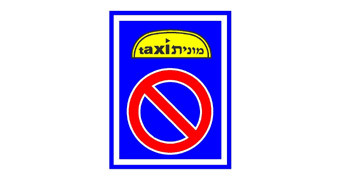 No entry only for public vehicles that have a lesser all up weight than what is indicated in the sign. Entry is permitted for pedestrians only. 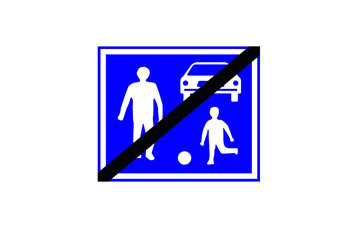 Children are not allowed to play here. No entry for pedestrians, including the “hard shoulders”. 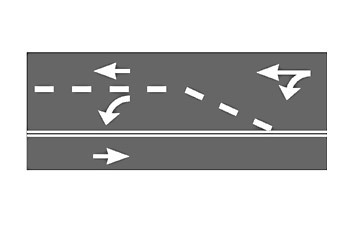 Traffic directions for the lanes of the next intersection. Public transportation is prohibited to proceed forward. 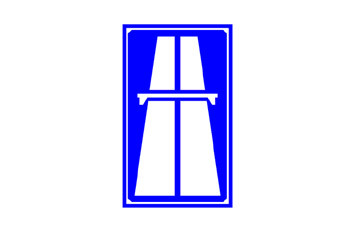 Vehicles on the right lane are prohibited to deviate to another lane. 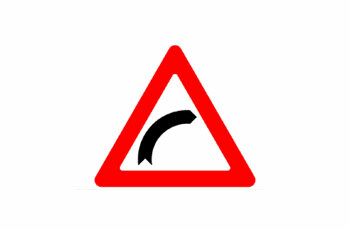 Enter curve in high speed and exit it slowly. Drive normally. The speed at the curve’s entry and exit is insignificant. 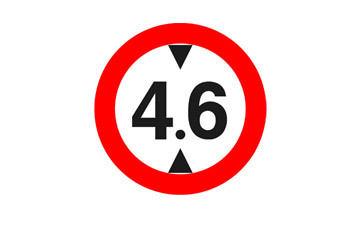 Reduce speed before entering the curve and gradually increase speed coming out of it. Honk before entering the curve. 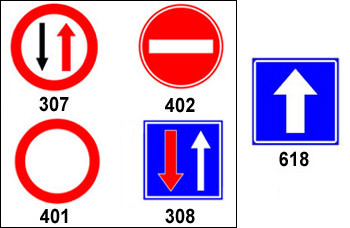 If traffic sign 618 is placed at an entry to a road, which traffic sign should be placed at the entry from the opposite side of the same road? 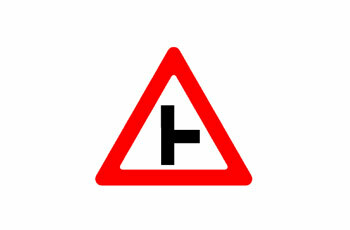 What are you required to do when the following road marking appears on your left? You are prohibited from crossing the unbroken separation line. Slow down and move to the left of the road. You should always drive on the right side of the lines. 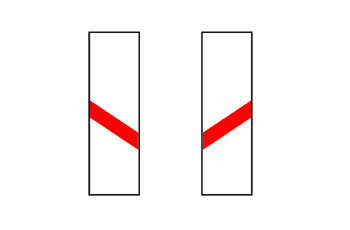 You may cross the lines when the broken line is on the right of the continuous line. 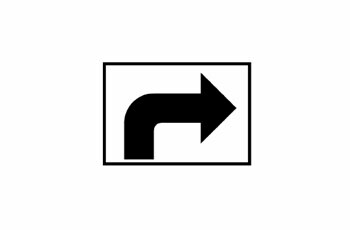 How should you make a left turn according to the following marking? From each of the marked lanes. From the right lane only. 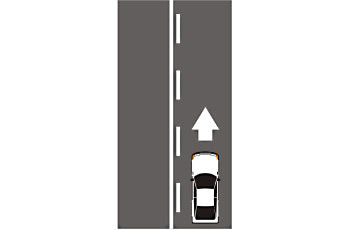 From the left lane in your direction of driving. 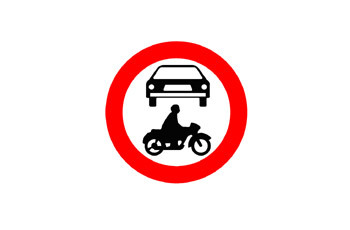 Are Bicycles permitted to enter a road when the following traffic sign is placed? Yes, entry is prohibited for public vehicles only. Yes, entry is prohibited for commercial vehicles only. 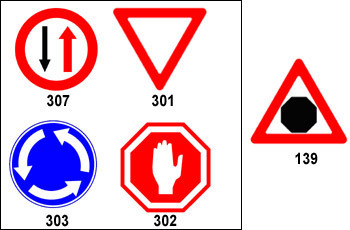 What is the difference between the following signs? Sign 505 indicates a stop for private buses. Sign 506 indicates a Tramway stop. Sign 505 indicates a Tramway Stop. 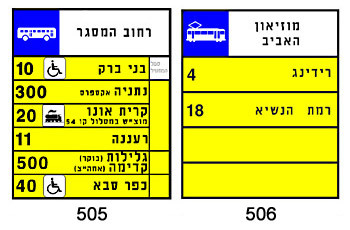 Sign 506 indicates a stop for Public bus transport. 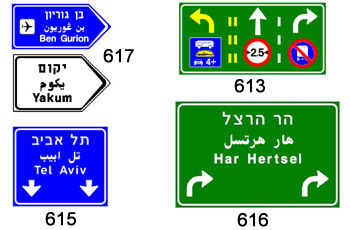 Sign 505 indicates a stop for Public Transport (Buses). Sign 506 indicates a stop for a Public Tramway. 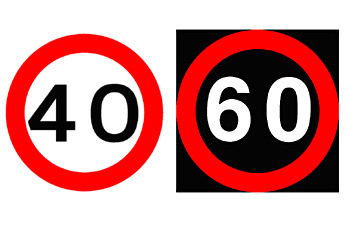 Sign 505 indicates a public transport stop on a Motorway (Freeway). Sign 506 indicates a public transport stop. 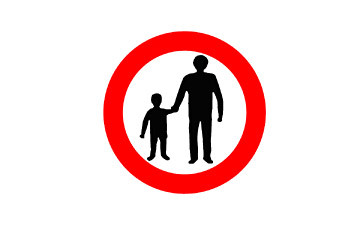 Is it obligatory to obey a portable traffic sign held by a member of the road safety guards? Yes, it is a legitimate road sign. No, because it was not authorized by the Road Safety Authority. No, it is not a legitimate road sign, but merely a recommendation. 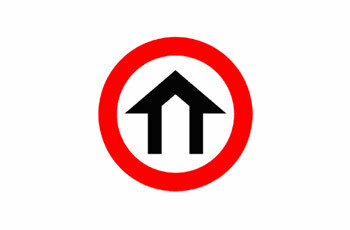 Is it determined by the following road sign which rules for giving right-of-way should be applied? 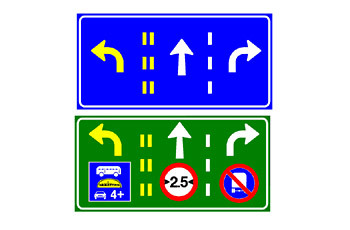 Yes, when the following road sign is placed in an intersection, right-of-way is given to vehicles that continue driving straight only. 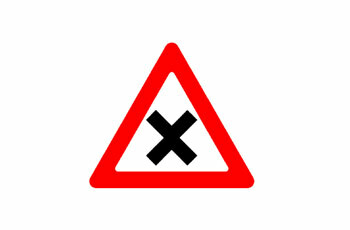 Yes, when the following road sign is placed in an intersection, right-of-way is given to public vehicles only. No, right-of-way rules are determined according to the traffic load. No, right-of-way is determined according to lawful right-of-way rules or according to the traffic signs that are placed in the junction. 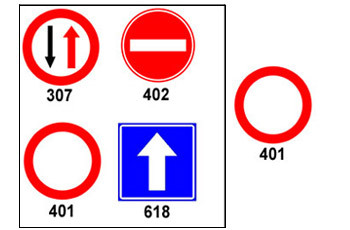 When traffic sign 401 is placed at an entry to a road, which traffic sign should be placed at the entry from the opposite side of the same road? 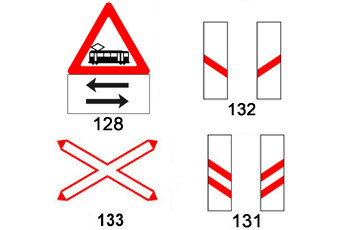 Which traffic sign should be placed at an intersection, after passing traffic sign 139 that is displayed in the following picture?